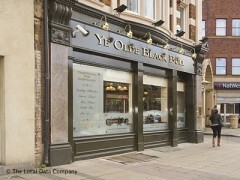 About: Ye Olde Black Bull is a contemporary pub with food, real ales and a TV for sporting events. All in all, a damn good boozer! Since its refurbishment this bar has gone upmarket. The food is quite good and the staff are friendly. I recommend visiting early where the roast beef is real and not the "wafer-thin" prepared of the premises rubbish that you get in other establishments. I aim to go back there again when i'm in Stratford. for this area but I did like the surroundings and the customers seemed normal which is a nice change from some of the other pubs.Would call in again and try some of the food on offer, and see how good the bar staff are when really busy.